For many of us with the CliftonStrengths® Talent Theme of Strategic®, the questions “What if?” or “What’s next?” often goes through our minds, sometimes so fast that we don’t even pay attention to it ourselves. 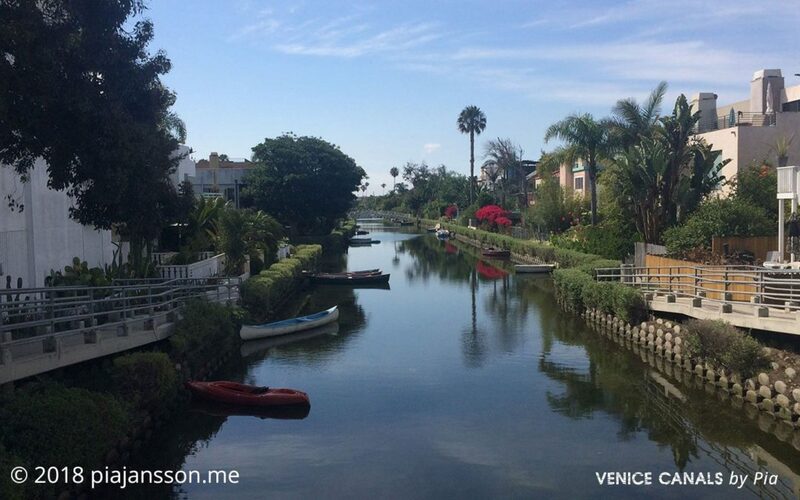 Another trait is the ability to quickly identify items that stand out when looking at the big picture. It could be seeing irregularities in patterns, missing pieces, a color, or simply connecting the dots and seeing the similarities between different teachings. What stands out in the picture above for you? What thoughts pop into your head by just looking at this picture? It could be as simple and immediate as coming to an unexpected road closure and quickly finding an alternate route, or simply having the awareness of taking an alternative route from the get-go. Maybe you’re seeing possibilities when others don’t? Many of us with this theme quickly sort out the path or alternatives, zooming in and out of the big picture view with ease. Do you recognize this in you? 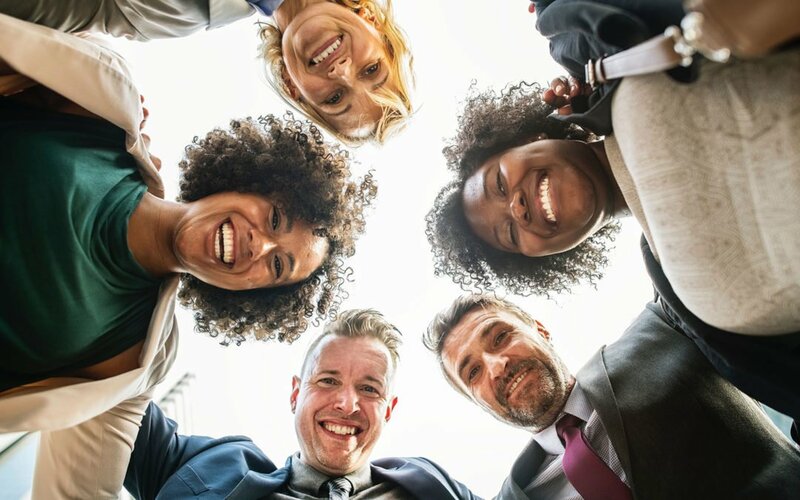 The one thing those of us with the Strategic® talent theme need to consider is that for people around us, our actions may occur as if we’re winging it. We process different options in our head so fast and don’t normally explain how and why we arrived at the chosen path. For many of us, it’s an intuitive theme. Added to that we love trying new things and have no problems making mid-course corrections as our focus is to find the best path forward. To keep those around us that are affected by our choices in the loop, we may need to consider sharing our thinking along the way. As with all CliftonStrengths® themes, the way a theme comes across or is experienced by the individual varies for a number of reasons, 1) Your other dominant talents 2) How strong the talent is for you, i.e. where it falls in the ranking of your overall strengths? 3) If it’s a talent or a strength that you use daily, or not? and 4) how this theme influences how you view your life? Added to this is the layer of the builder talent role you bring (BP10™ Assessment), and of course your trade skills and experiences. What I found super interesting, after talking with a fellow coach, Jeff @ Prism Perspective Coaching, is, again, how different each role shows up for each individual. For example, for me, by just looking at my role of Conductor, and with the Relationship talent as my #1 (BP10™) together with my #1 CliftonStrengths® talent of Strategic, my focus is on WHO and PEOPLE. This means that people stand out for me over processes and that includes traffic or navigating crowds with ease. While a variety of things will stand out for me, it tends to be the impact on people that stir my pot and get me in action. For someone else, with Strategic, it could be and often is, something completely different. Do you have Strategic® as one of your dominant talents? How does it play out for you? Please comment below, I’d love to know. Are you curious what your talents might be? CLICK HERE for more information about the CliftonStrengths® Assessment or HERE for the BP10™ Assessment. Lastly, visit Gallup’s YouTube channel for more information on the CliftonStrengths® theme of Strategic® HERE. Today I’m super stoked to announce the launch of a new collaborative book, written with a dozen other Gallup-certified Strengths Coaches! Inside, we tell our stories of how our lives have been changed, and how coaching conversations have changed the lives of others. 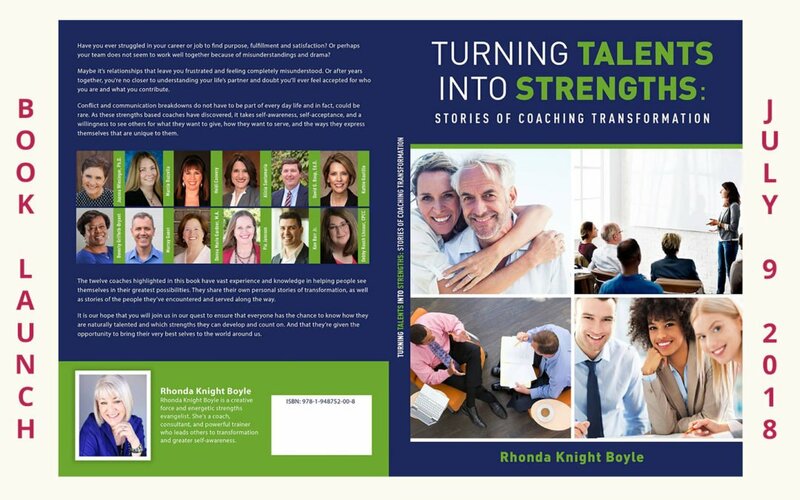 Grab your Kindle copy of Turning Talents into Strengths: Stories of Coaching Transformation right now for only $3.99. 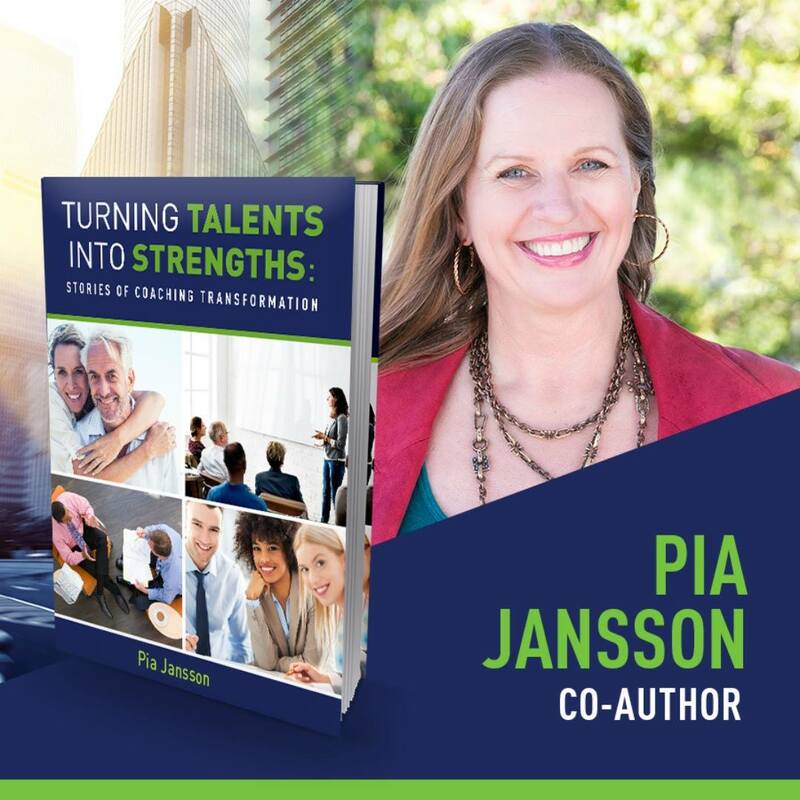 Here’s an excerpt from my chapter: “When you read your Strengths Insight Report from the CliftonStrengths® Center you will get present to your greatest potential. Everyone I’ve coached or spoken with so far all say, “Yep, that’s so me,” after reading it. You’ll also discover the gaps of what could be keeping you from reaching it. A Strengths coach can stand in the gap and act as a bridge for you. It’s so much faster to have a coach guide you in the process of stepping into your greatness and owning it fully. Walking people through this process and seeing the confidence, engagement and gratitude for who they are is amazing to witness, and the epiphany of why people don’t always “get” us. It’s a process, to embrace your greatness. A big thank you goes out to our compiler and editor extraordinaire Mrs. Rhonda Knight Boyle. I had so much fun being on the Strengths Activation Show today. 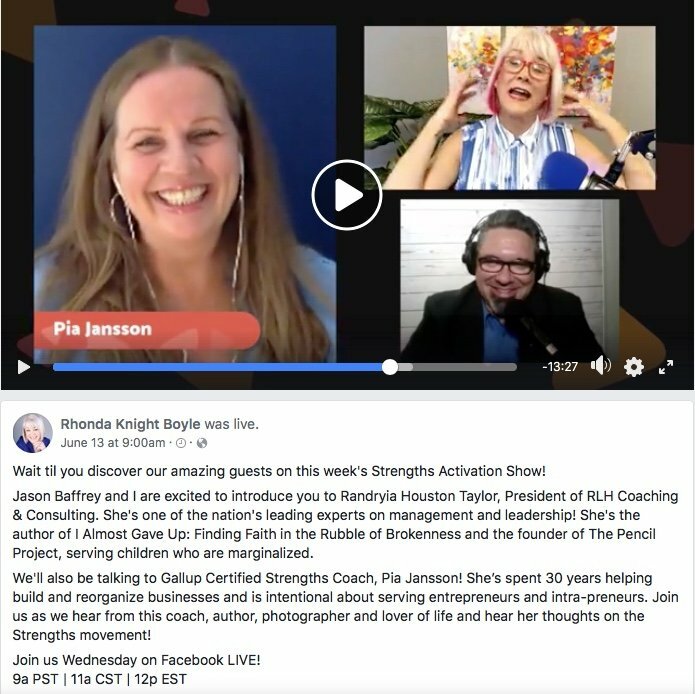 Click below to listen, I’m on around the 30-minute mark and you’ll enjoy listening to Dryia Houston Taylor too who kicked off the guest portion. Thanks to Rhonda Boyle Knight and Jason Baffrey. What’s your life purpose and what do you do? … is a question that had me twisted for years, looking for “it” without being able to verbalize the energy of what the “it” was. And yes, while having fun has definitely been a core “purpose” in life for me, what if you can’t connect to what fun would be like, or it still feels as if it’s more than that? I found this TedX talk the other week and it’s brilliantly simple and well worth the 10 minutes. In this video, Adam Leipzig shares a simple and quick formula to connect to your life purpose. What I love about this is that it’s a fun conversation starter and a different twist to answering the question “So, what do you do?”. Thank you, for this talk Mr. Leipzig!